Some sources present the aircraft was claimed as shot down by SA-7A. EAF : Egyptian Air Force. LARAF : Libyan Arab Republic Air Force. (*) Some sources present the aircraft was claimed as shot down by SA-7A. Mirage 5DE, Libyan Arab Republic Air Force. 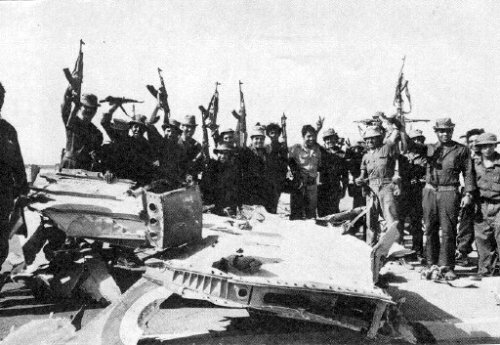 Remains of an EAF fighter shot down by LARAF Mirages on 21 July 1977. According to contemporary Libyan sources the aircraft in question was a MiG-21; according to Egyptian sources it was a Su-7. Libyan pilots were credited by at least two air-to-air kills during the war. Cooper, Tom: Libyan and Egyptian Skirmishes, 1977-1979, http://www.acig.org/artman/publish/article_353.shtml, http://s188567700.online.de/CMS/index.php?option=com_content&task=view&id=221&Itemid=47. Жирохов, Михаил: Ходил Каддафи на Каир..., in АвиаМастер, № 02, 2006.